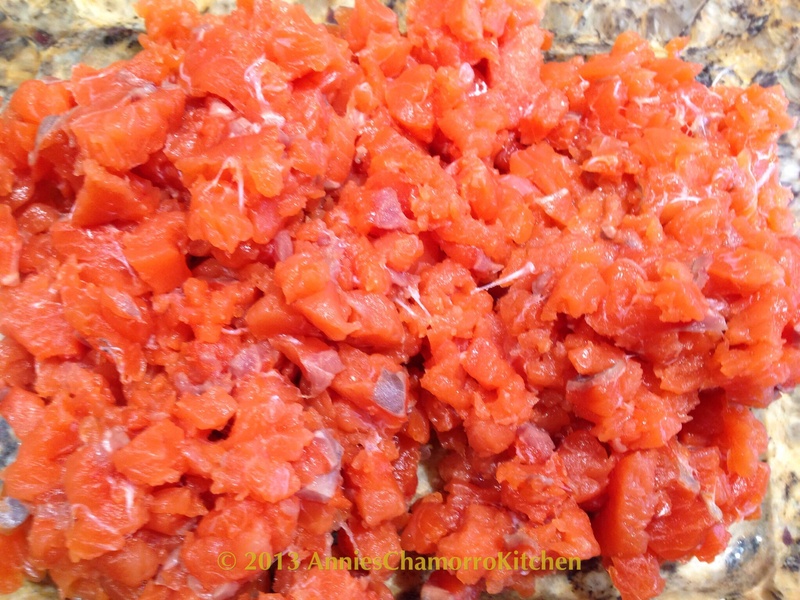 Kelaguen in Chamorro describes a dish that’s prepared by mixing the main ingredient (usually chicken, beef, deer, or seafood) with lemon or lime juice, onions, salt, and hot pepper. Chicken kelaguen is usually prepared with cooked (grilled, broiled or boiled) chicken. The other types of kelaguen–beef, deer, shrimp, and various types of fish–are most often prepared raw, with the meat or seafood getting cooked with the addition of an acid, usually lemon or lime juice. 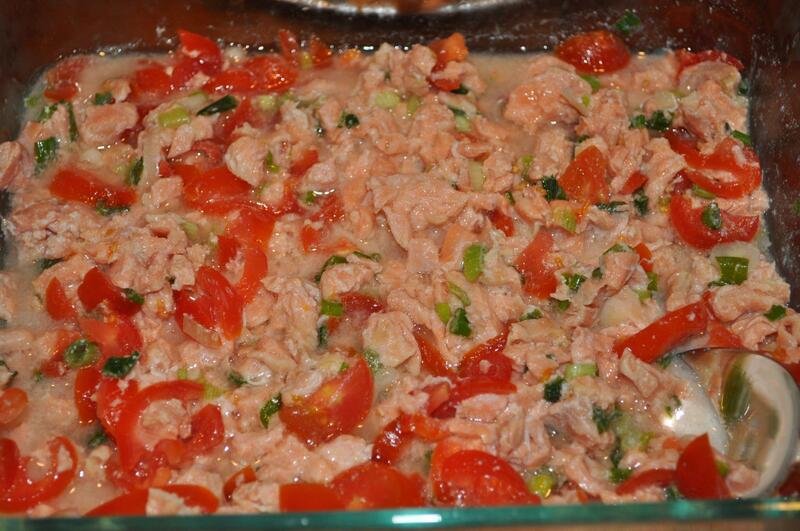 Kelaguen is a staple dish at Chamorro parties. Sometimes, especially on Guam, an entire table is devoted to several types of kelaguen. I prefer fresh salmon with this recipe. 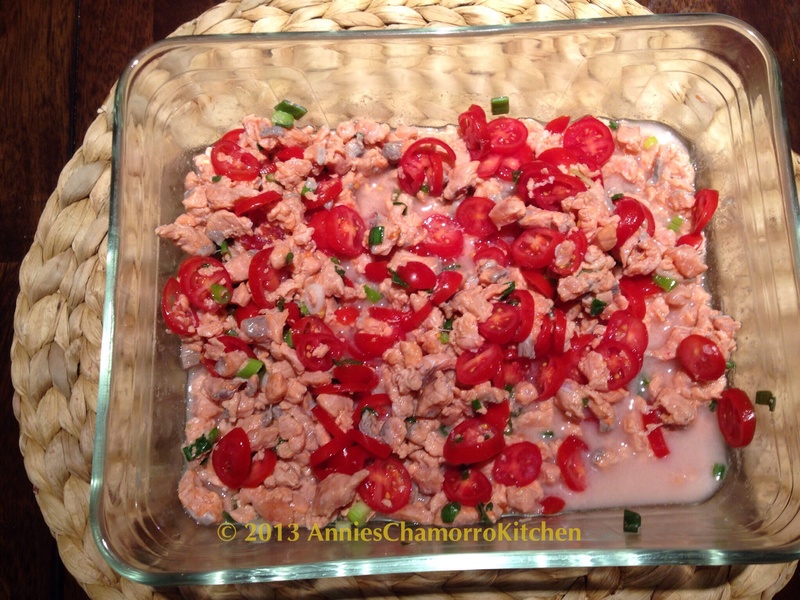 If you’re in a pinch, canned salmon kelaguen is also tasty, but I still prefer fresh salmon any day. 1. Rinse the salmon filet. Pull out any salmon bones. Remove the skin, or leave it on if you prefer. I like the skin removed for kelaguen. 2. 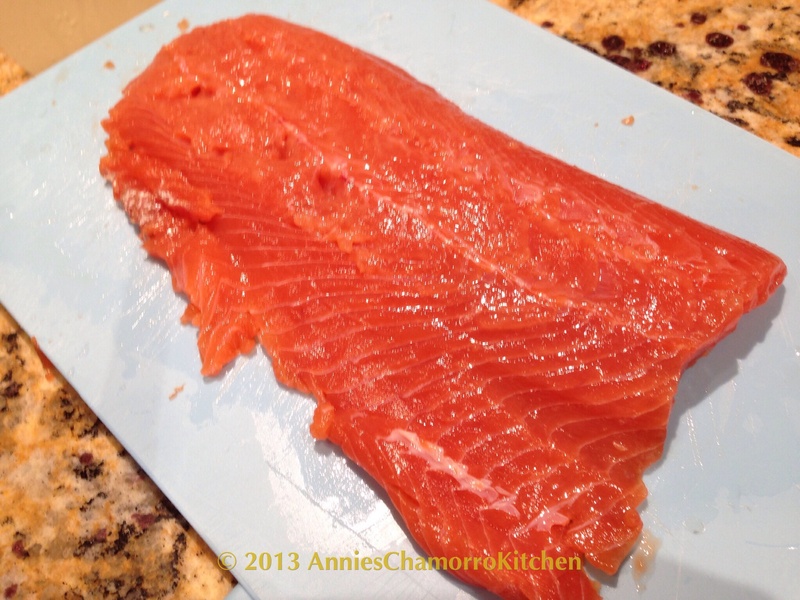 Cut the salmon into small pieces. 3. 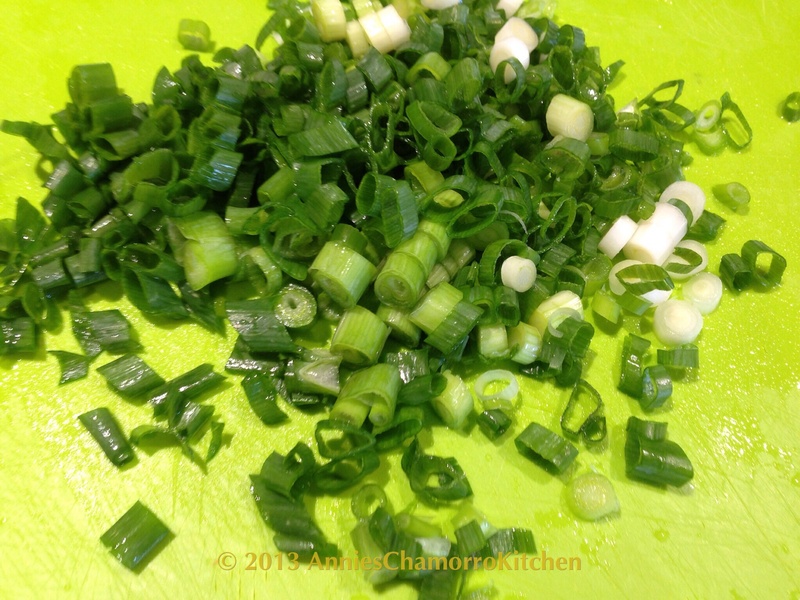 Thinly slice the green onions. 4. 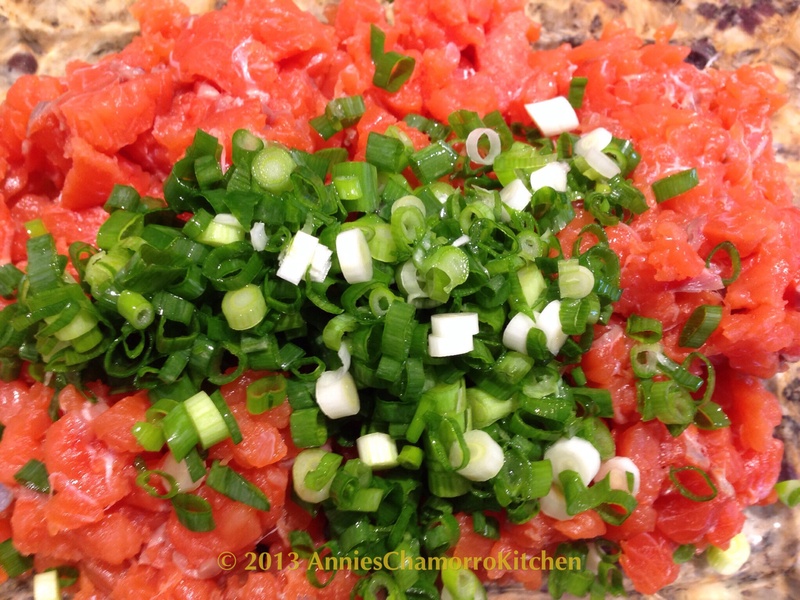 Mix the salmon and green onions together in a small bowl. 5. Squeeze about 1 cup of lime juice over the salmon and onions. Sprinkle salt over the mixture; start with about 1 teaspoon. Stir gently to combine all the ingredients and to dissolve the salt into the lime juice. Add more or less lime juice and/or salt, to taste. 6. Stir in the diced tomatoes. Optional: Add hot pepper, as much as you like. Serve with hot rice or titiyas. ENJOY! Haven’t been back home for decades, your recipes sure brings back memories of guamanian food growing up with. Tks for the recipes which I’ve been trying. I must say though that nothing beats the authentic food on the island especially during parties and fiestas. I agree—-nothing beats having ready access to all the fresh food from home. I sure do miss that. In 1971 we lived in Dededo. As a small child the neighbors were always welcoming to me, a skinny little girl. When my neighbors would catch deer they would make deer kelaquen with the boonie peppers. They taught me how to make green pickled papaya. I feel privileged to have these recipes passed down to me. So yummy!!!! Do you have a recipe for beef kelaguen? I don’t have one posted, but to make it, thinly slice lean beef (flank steak is good). Add lemon juice, onions, salt to taste, and hot pepper (optional). Let the meat soak in the lemon juice mixture until it “cooks”. Serve with rice or tortillas and enjoy. My cousin married a beautiful woman from Guam, whom I refer to as my sister….this dish is so tasty and I love it every time she makes it….YUMMMY!! This was the best salmon kelaguen. 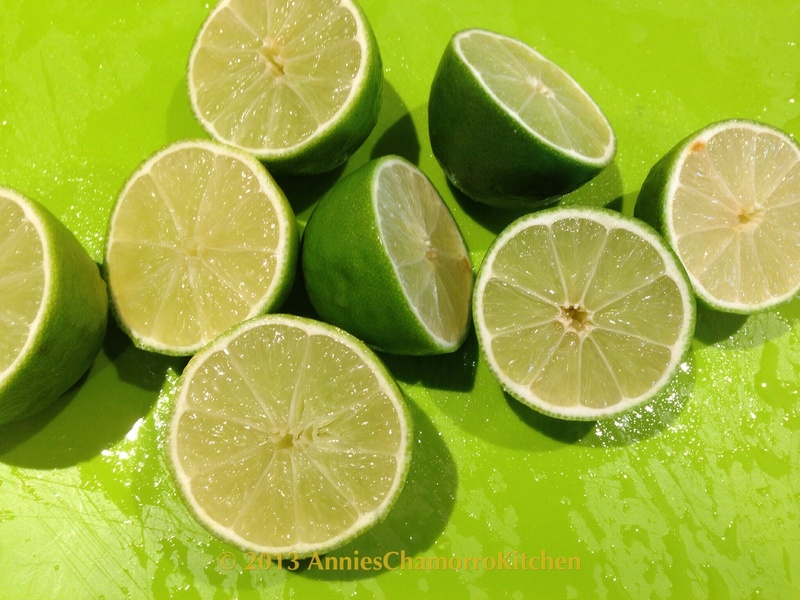 Fresh limes are the key ingredient to this delicious dish made by my beautiful wife, Annie!